Porsche has pulled out all of the stops to meet the needs of a super-rare Carrera GT, fully restoring the car and giving it a one-of-a-kind look. Now, the idea of a full restoration on a car that entered production in 2003 may seem a little unnecessary, but that didn’t stop the Stuttgart firm from doing it. To start with, the supercar was entirely disassembled into individual pieces. From there, every part received a full check over, with refurbishment or replacement where needed. Meanwhile, Porsche Classic — the manufacturer’s special projects arm for work on its older models — brought a model-bespoke paint finish to the car. 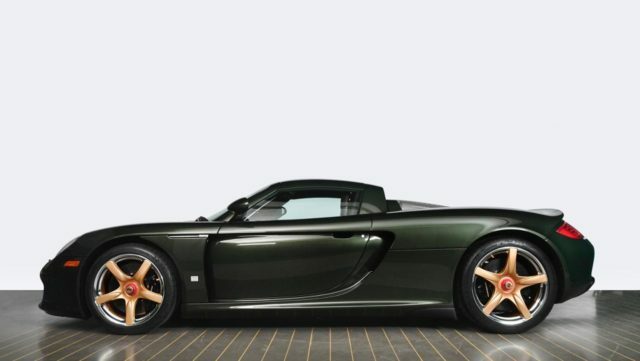 Oak Green Metallic first appeared in the firm’s line-up in the ‘70s, but has not been available as a catalogued colour in recent times — and was never offered on the Carrera GT. However, Porsche Classic has finished the supercar in the shade, while also treating it to gold accents for the nameplate and magnesium wheels. There was also the issue of repainting the wheels in a chrome-effect colour. The firm says concerns were risen over a traditional polish and restoration to the single-piece magnesium units, in fear that their structural rigidity would be compromised as a result. To prevent this, it instead coated the wheels in silver layer before applying lacquer to protect the metal. No word on just how much it cost the US owner to have this treatment done to their Porsche Carrera GT, but we suspect a lot.